This month finds us busy with projects as we anticipate being gone for almost the entire month of February. High on the "to do list" was getting 2 new singing outfits. This included making sure that our 6 young men plus Marlin had matching ties for both outfits. With the Lord's blessing at resale shop, ties that came with dress shirts, plus 2 ties from a friend (thanks, Pam!!) we were able to get 2 sets of ties the entire bunch. That adds up to 14 ties. Denver thought it would be fun to see how many ties he could wear at the same time. In spite of all the activity of trip preparations, there are still Math and Language lessons to be done. Every year after Christmas, we put on our fridge the many beautiful family pictures we receive from family and friends. Chelsy assists her father in the ministry by typing the schedule, sending out letters and posters to contact people, and keeping our web site current. Last evening we got together with some friends, the Yoder's and Chmelars, for an evening of food, fun, and music. There was lots of good food! There was this really fun game called "Screamo" and yes, there was plenty of screaming in this game. I won't give you all the rules (are there any rules to this game?) but I will tell you that it is a great game for young and old, it tests your basic math skills, and it has plenty of action! Oh, and you can eat and play at the same time! After the game, the young people got out the fiddles, mandolins, a guitar, bass guitar, and banjo and played some great music. Food + Games + Music + Good Friends = Fun. Thanks Yoders and Chmelars for the great time! Happy Trails! Our friends, the Ockenfels family, came over for dinner on New Year's Eve. What a special way to bring in 2008.We never intended to actually stay up until midnight but we had so many issues to discuss, songs to sing, and games to play that midnight came and we were still awake! Chess is a favorite game of our boys. 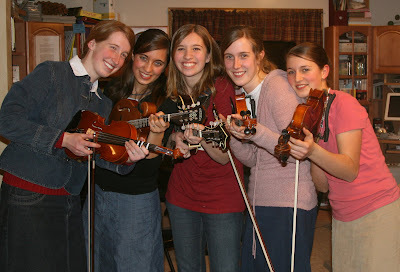 Allison Bontrager and Allison Ockenfels played violin. Aaron and Alexander played "Dueling Banjos". It was some great pickin', boys!